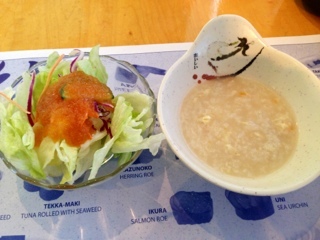 If you read reviews about Ni-Ji Japanese Restaurant, you may be confused why some customers exclaim it’s the best sushi in Toronto and others grumble in disappointment about travelling to eat at the place. Hopefully, I can shed some light on this disconnect. Firstly, Ni-Ji is not the best/most authentic sushi you will find in Toronto; establishments such as Hiro Sushi and Nami or maybe even Zen Japanese Restaurant, also in Scarborough, would be better choices. 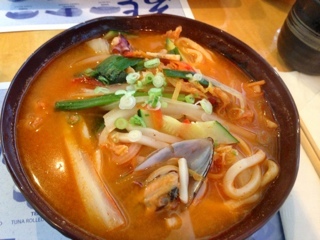 With that said, what brings people to Ni-Ji is its relatively decent tasting dishes offered at extremely reasonable prices. The restaurant is busy, expect waits on weekends, but keeps ingredients fresh (of utmost importance for something like raw fish). 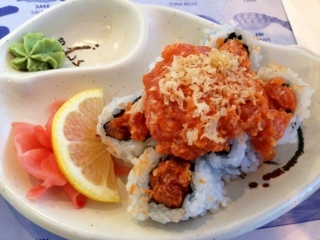 The spicy salmon maki ($4.95) is an explosion of salmon with tons in the roll and more topping it as well. For under $5 you’re served quite a substantial portion of fish! Besides, I enjoy the roughly diced pieces so they are still distinct pieces rather than becoming a pulverized paste mixed with tempura bits that some restaurants serve. The sauce has a nice hint of spiciness to it but not so overpowering that it makes you think that you’re dipping the sushi into sriracha. Generally, my go-to are their bento boxes which provides me with tastes of everything to satisfy cravings. Bento #1 ($11.95) containing salmon teriyaki with bean sprouts, fried tofu, a California maki, rice and slivers of pickled daikon seems popular. Although there's a generous portion of salmon, it's overcooked and too dry for my taste. 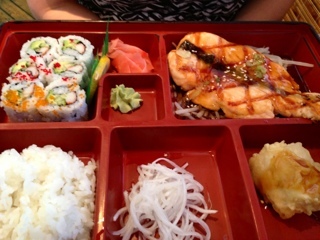 Rather, I prefer Bento #2 ($11.95) which has beef bulgogi, fried tofu, a California & salmon roll and rice. The bulgogi pays homage to the Korean options being offered at the restaurant (which of course shows the restaurant is not the most “authentic”) and is thinly sliced and well marinated. Their sushi dinners are also satisfying. The Kyoto ($11.95; 8 pieces of sushi, 3 pieces of California and 3 pieces of salmon), Sapporo ($12.95; 7 pieces of sushi, 6 pieces of maki and 1 salmon hand roll) and the maki combo ($11.95; California, salmon and cucumber maki rolls) are fresh and palatable. For the Kyoto and Sapporo, I found they generally include additional salmon sushi above what’s stated on the menu which is always a pleasant surprise. 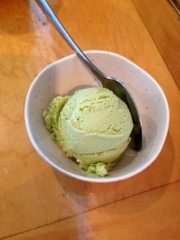 All meals are usually served with a bowl of simple salad, Korean congee (has an interesting earthy smoky taste that I like) and green tea ice cream. If you order any bento boxes, you’ll also be offered a bowl of mediocre miso soup as well. 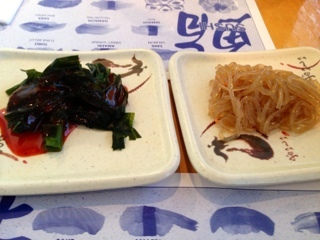 Right after ordering, two simple banchan dishes of seaweed drizzled with a sweet beany Korean chilli sauce and marinated vermicelli noodles arrive. Sometimes, Ni-Ji also serves two pieces (yes pieces) of edamame per person with the banchan as well. Although Ni-Ji’s dining room is small, it actually sits quite a few people. Service is lightening quick with the staff running like a well-oiled machine; unfortunately, sometimes too efficient as they take things away when other guests are still eating and present the bill as soon as the last dish is whisked away. However, turnover is usually pretty fast and if you can’t stand to wait, you could always do take-out which seems to be a popular choice amongst locals.